One of the profound challenges that teachers face these days is - classroom behavior. Disruptive behavior results in lost teaching time and un-conducive learning environment. The key to nipping behavioral problems in the bud; is to create a positive environment in classroom. There are a lot of ways and means to encourage positive behavior in classrooms, but, to begin with - laying a good foundation in pupils is the most important aspect. Here are some tips and guidelines to bring about positive behavior amongst students. This is one of the most important regimen which a teacher can deploy to bring about order, discipline and attentiveness in a class. A teacher should resist from conducting a class until there is complete order restored. Persistence is one of the fundamental and effective tools, which a teacher can use to get the class to behave. Students should ideally live up to the expectations of teachers. It is the duty of the teachers to ensure that students behave in a manner appropriate and conducive to learning. Teachers should avoid getting angry at irresponsible or reprehensible behavior of students. Instead, teachers should exude a compassionate outlook to bring about behavioral changes in students. It is the duty and moral obligation of every teacher to recognize, understand and address behavioral problems in students. This has to be done on a consistent and gradual basis. Change cannot be brought about overnight. So, the efforts should be concerted, consistent and focused. Students may find the regimen to be rigorous, but, teachers should be consistent in their efforts to bring about positive change in students. Teachers should have the acumen to envisage teaching challenges that they may encounter in an unruly classroom. Visualizing these challenges and bottlenecks will help the teachers in dealing with unruly students successfully. Teachers should define a boundary line for every class at the outset. Students should be clear on what areas they can tread and what areas they cannot. Drawing up an analogy to a box, teachers should clearly define what goes inside a box and what should stay outside. A word of appreciation can do wonders. Instead of expressing disappointment, despair or resentment, teachers should try to appreciate good behavior in a class. This can have a positive effect on students who tend to behave badly in a class. Respect is a reciprocal phenomenon. To earn respect, teachers should learn to treat students with respect, compassion and dignity. Teachers should always provide students with choice. It is incumbent on the students to make the right choice. If students happen to make a bad or wrong choice, they should be prepared to face the consequence of the wrong choice. Likewise, a good choice should be duly appreciated and rewarded. Humor should be an integral part of our lives. We should be courageous enough to admit and laugh at our mistakes. This can act as a counterbalance when you are left facing with an annoying situation. It is not possible to have a disciplined teaching and learning environment always. It is one thing for the students to know about the rules and another thing to follow and adhere to the rules. But with a little patience and perseverance, a foundation for respect and positive behavior can be laid in a classroom. We at Vagad Pace Global School ensure that there is a strong bond of mutual respect between teachers and students. 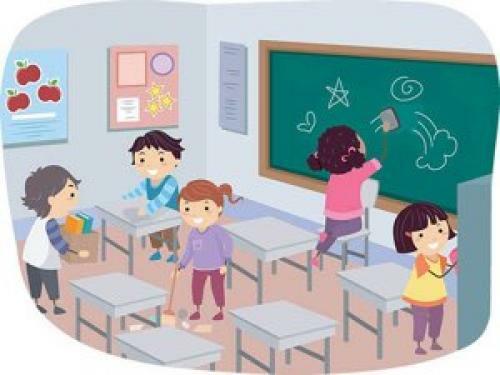 Every effort is taken to ensure that students are well behaved in the class. A condusive learning atmosphere is the key towards enabling students to have holistic growth and overall development. Vagad Pace Global School ensure that there is a strong bond of mutual respect between teachers and students.